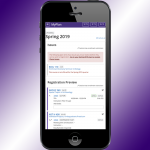 Now you have an improved and simplified way to preview the courses you plan to take in upcoming quarters with the new “Registration Preview” page in MyPlan, the academic planning tool. Sign in to MyPlan and click on the relevant quarter in the header to access the new Preview page (only available to students with a UW NetID). It shows scheduling conflicts and highlights actions you need to take. You’ll also see your estimated registration date and which courses are ready to get passed on to the web registration system.